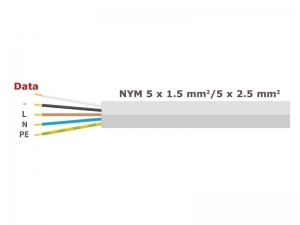 Laid is standard NYM cables, recommended is five-pole cable so that one wire is free for future use. The bus modules are immediately connected to the house wiring, without external power supplies or filters. Loads are connected to the bus modules. Peripherals are connected to the P-, T- or I-Ports of the modules. LCN needs only one additional wire for data transfer in a conventional installation network. This data wire can be handled without additional rules as LCN complies with VDE regulations. Installation costs remain very low as LCN does not require an additional wiring system, so every building – big or small – benefits from it. 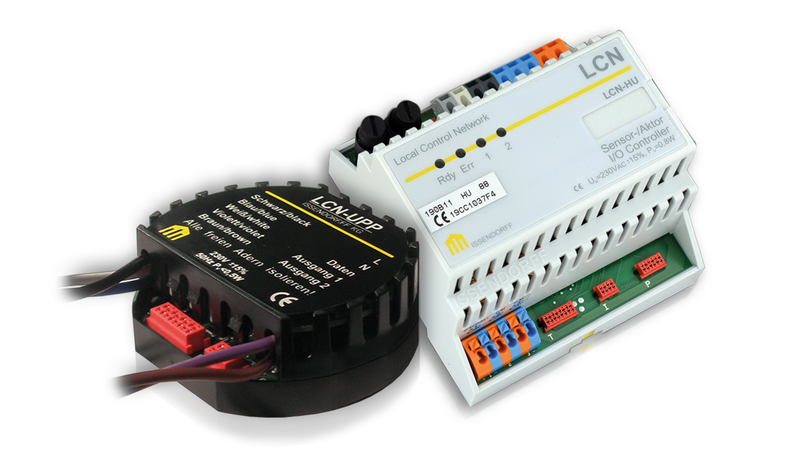 The LCN bus system uses an easy understandable technology and an uncomplicated installation. It is based on intelligent bus modules equipped with a powerful microprocessor. They not only handle all communication, they also control, regulate and monitor all functions in a building, either automatically or requested by the user. A central server is not needed. 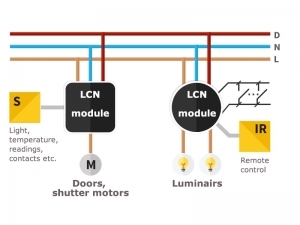 LCN modules are interposed between main power and electrical loads like fixtures or motors for shutters or blinds. Sensors for light, presence or motion detection are connected to the bus modules. Also push buttons and remote control elements are connected to the modules directly. With the parametrization software LCN-PRO the system gets programmed. This can be done prior to the real installation in the electrician’s office. After the installation the parametrization is transferred into the modules. LCN modules are available as flush-mounted or DIN rail modules for distributed or centralised use. The flush-mounted modules can be assembled in flush-mounted boxes behind keypads, sockets and switches or even in junction boxes. 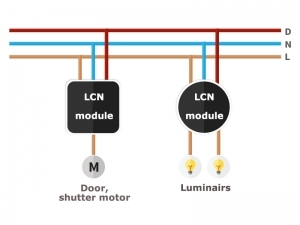 In contrast to other bus systems, LCN modules contain various sensor inputs and actuator outputs in the same module as standard. This means that any sensors and actuators can be activated on site. All settings are permanently stored in the configuration memory in the intelligent LCN modules. The settings will not be lost, even in the event of a power outage. 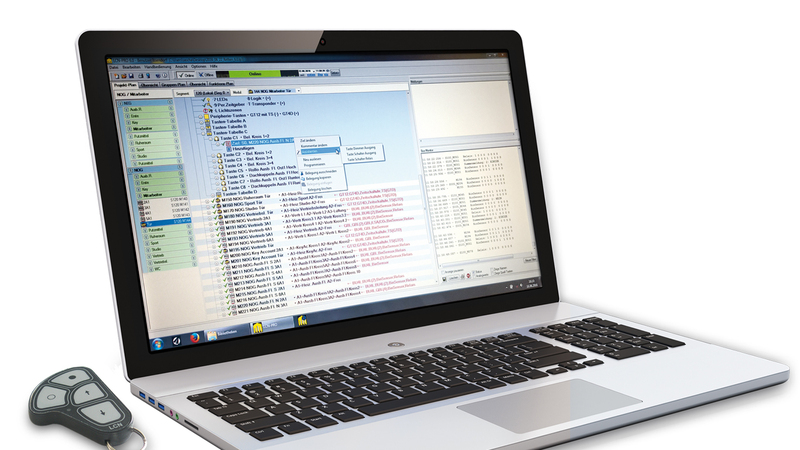 With the LCN programming software, the current state of all LCN modules in a system can be read and analysed at any time and be changed and processed if necessary. Each module is given a password to protect LCN systems and/or LCN modules against unauthorised access. The LCN-PRO is the name of the tool that installers use. This software can be used to conveniently program all LCN systems regardless of the system’s configuration and size. Freely available updates always ensure full compatibility with the latest generation of modules. The LCN-PRO can program any number of projects. Individual projects can be stored in a template pool and be reused at any time by dragging and dropping them into any LCN system. Two data back-ups (one on the PC and one in the system) and the software’s ability to recognise available component versions prevents any faults from occurring. The LCN-PRO has two modes of operation: online and offline mode. In offline mode, the system is pre-configured and stored in a database. The programming is transferred to the project later when a connection is established. If the LCN-PRO is connected to the system in online mode, it can read and change the system’s current programming. In addition to general programming, the software controls errors and protocol functions in the LCN system. The LCN-GVS is a visualisation system that can control and manage almost any number of LCN systems and buildings anywhere in the world. 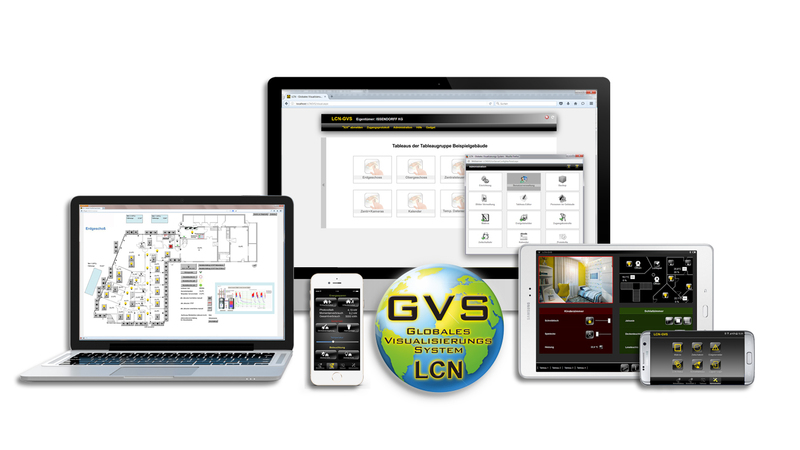 As the LCN-GVS is purely browser-based, any web-enabled PC, smartphone, etc. in the world can access all of the buildings. With extensive user account control, permissions to access individual loads, rooms, buildings or groups can be granted. The connections between the LCN-GVS visualisation system and properties around the world are protected by encrypted connections. The LCN-GVS extensively monitors all connected LCN systems and presents the states as a graph. Incident reports are available for monitoring. They interconnect any processes, measured data, calendars, etc. and prompt actions and messages. The LCN-GVS sends emails, SMS messages (time-controlled in accordance with the service schedule) and push notifications direct to mobile phones. The built-in timer switch can combine several calendars and trigger associated actions. The extensive access control combines all five LCN access methods, IR transmitters, transponders, universal transponders, active transponders with more than 4 m detection range, fingerprint sensors. It enables time-dependent, personal profiles to be created for each access point. Every access attempt is recorded and can be verified, even years later. The most important features of the LCN-GVS are the detailed user management, the high-performance editor that specifically recognises known Windows applications and the user-friendly menu guide that makes it easy to handle the intuitive visualisation system. Installation assistants support the administrator’s work so that even extensive configurations can be executed quickly.